We have previously demonstrated that endoxifen is the most important tamoxifen metabolite responsible for eliciting the anti-estrogenic effects of this drug in breast cancer cells expressing estrogen receptor-alpha (ERα). However, the relevance of ERβ in mediating endoxifen action has yet to be explored. Here, we characterize the molecular actions of endoxifen in breast cancer cells expressing ERβ and examine its effectiveness as an anti-estrogenic agent in these cell lines. MCF7, Hs578T and U2OS cells were stably transfected with full-length ERβ. ERβ protein stability, dimer formation with ERα and expression of known ER target genes were characterized following endoxifen exposure. The ability of various endoxifen concentrations to block estrogen-induced proliferation of MCF7 parental and ERβ-expressing cells was determined. The global gene expression profiles of these two cell lines was monitored following estrogen and endoxifen exposure and biological pathway analysis of these data sets was conducted to identify altered cellular processes. Our data demonstrate that endoxifen stabilizes ERβ protein, unlike its targeted degradation of ERα, and induces ERα/ERβ heterodimerization in a concentration dependent manner. Endoxifen is also shown to be a more potent inhibitor of estrogen target genes when ERβ is expressed. Additionally, low concentrations of endoxifen observed in tamoxifen treated patients with deficient CYP2D6 activity (20 to 40 nM) markedly inhibit estrogen-induced cell proliferation rates in the presence of ERβ, whereas much higher endoxifen concentrations are needed when ERβ is absent. Microarray analyses reveal substantial differences in the global gene expression profiles induced by endoxifen at low concentrations (40 nM) when comparing MCF7 cells which express ERβ to those that do not. These profiles implicate pathways related to cell proliferation and apoptosis in mediating endoxifen effectiveness at these lower concentrations. Taken together, these data demonstrate that the presence of ERβ enhances the sensitivity of breast cancer cells to the anti-estrogenic effects of endoxifen likely through the molecular actions of ERα/β heterodimers. These findings underscore the need to further elucidate the role of ERβ in the biology and treatment of breast cancer and suggest that the importance of pharmacologic variation in endoxifen concentrations may differ according to ERβ expression. Each year, nearly 1.3 million women are diagnosed with breast cancer worldwide and about two-thirds of these individuals are determined to have hormone sensitive tumors based on the expression of estrogen receptor-alpha (ERα). Tamoxifen, a selective estrogen receptor modulator (SERM), remains an important therapeutic agent in the treatment of women with endocrine sensitive breast cancer as it is known to effectively inhibit the proliferation-inducing effects of 17β-estradiol (estrogen) in ERα positive breast tumor cells. Like many drugs, tamoxifen is extensively metabolized in the body by the cytochrome P450 enzyme system resulting in the production of three primary metabolites; 4-hydroxytamoxifen (4HT), N-desmethyl-tamoxifen (NDT) and endoxifen [1–3]. Recent reports have demonstrated that steady state circulating levels of tamoxifen, 4HT, and NDT in women receiving the standard dose of tamoxifen therapy (20 mg/day) are 300 nM, 7 nM, and 700 nM, respectively . However, plasma endoxifen concentrations are highly variable, ranging from 5 to 180 nM, due to the activity of the cytochrome P450 2D6 (CYP2D6) mediated oxidation of NDT . Prospective studies have demonstrated that genetic CYP2D6 polymorphisms, and drugs, which reduce or abrogate CYP2D6 enzyme activity, significantly decrease endoxifen plasma concentrations [3–5]. These findings encouraged investigators to examine the hypothesis that CYP2D6 genotype status, and thus endoxifen concentrations, would affect clinical outcome in women treated with tamoxifen for their breast cancer. Although some controversy remains, the majority of the reports indicate a relationship between CYP2D6-related low levels of endoxifen and poor outcomes [6–15]. Past studies from this laboratory support these clinical findings as we have demonstrated that endoxifen is the most potent tamoxifen metabolite responsible for inhibiting estrogen induced gene expression changes and proliferation rates in ERα positive breast cancer cells at clinically relevant concentrations . At this time, the clinical development of endoxifen is ongoing, with NCI supported phase I studies of endoxifen hydrochloride set to commence in early 2011 at both the Mayo Clinic and NCI. Tamoxifen and its metabolites are known to function by blocking the effects of estrogen, a steroid hormone that binds to, and activates, two main ER isoforms, ERα and ERβ. The role of ERα in breast cancer has been studied extensively for years, and its protein expression remains the most important biomarker in the treatment of this disease. However, the potential functions of ERβ in the progression and treatment of breast cancer have largely remained a mystery. In vitro studies have revealed that the actions of these two receptors are drastically different at the level of gene expression, both in response to estrogen and anti-estrogens [17–23]. Numerous reports have demonstrated that exposure of ERα expressing breast cancer cells to estrogen results in increased rates of proliferation while more recent studies have suggested that expression of ERβ alone [21, 24, 25], or in combination with ERα [26–28], inhibits cell proliferation following estrogen exposure. The summation of these in vitro studies suggests that ERβ may function as a tumor suppressor. A number of clinical studies have revealed that the presence of ERβ protein in breast tumors correlates with improved rates of recurrence, disease-free survival and overall survival [29–38] while others indicate little correlation [39–41] or even worse prognosis [42, 43]. Additional studies have suggested that the expression of ERβ in breast tumors increases the effectiveness of tamoxifen therapy [44–46] and one report found that 47% of breast tumors classified as ERα negative express ERβ . These observations highlight the need to further define the relevance of ERβ in breast cancer progression and treatment. Based on the foregoing, the objective of the present study was to determine the role of ERβ in mediating endoxifen action in breast cancer cells. The results of this study demonstrate that ERβ enhances the anti-estrogenic effects of endoxifen in breast cancer cells likely through the actions of ERα/β heterodimers, and suggest that the achievement of higher endoxifen concentration may not be necessary in patients whose tumors express ERβ and that these same patients may benefit from tamoxifen therapy regardless of their CYP2D6 genotype. MCF7 cells were generously provided by Dr. Robert Clarke (Georgetown University) and were cultured in phenol red-free Dulbecco's modified Eagle's medium/F12 (DMEM/F12) medium containing 10% (v/v) fetal bovine serum (FBS) and 1% (v/v) antibiotic-antimycotic (AA) solution in a humidified 37°C incubator with 5% CO2. MCF7 cells stably expressing ERβ were generated using an S-tagged-Flag-tagged ERβ expression construct (pIRES2-EGFP) developed in our laboratory. Individual MCF7-ERβ clones were isolated following selection with 300 μL/mL G418. Doxycycline inducible Hs578T-ERβ, U2OS-ERβ and U2OS-ERα/β cells lines were cultured as previously described [19–21]. All cell treatments were conducted in phenol red-free DMEM/F12 medium containing 10% triple charcoal stripped FBS. 17β-estradiol and doxycyline were purchased from Sigma Aldrich (St. Louis, MO, USA). PPT (propyl pyrazole triol) and DPN (diarylpropionitrile) were purchased from Tocris Biosciences Inc. (Baldwin, MO, USA). (Z)-endoxifen was synthesized by Dr. Abdul Fauq (Mayo Clinic, Jacksonville, FL, USA). The polyclonal ERβ specific antibody utilized in this study was developed by this laboratory. Briefly, a protein fragment of ERβ spanning amino acids 1 to 140 was cloned into the pGEX-5X-3 vector (Life Technologies, Carlsbad, CA, USA) and expressed in DH5α bacterial cells. Purified ERβ protein was immunized in rabbits by Cocalico Biologicals Inc (Reamstown, PA, USA). ERβ specific antibodies were purified from serum using an affinity purification column containing the ERβ protein fragment. We have extensively characterized this antibody through Western blotting, immunoprecipitation, immunohistochemistry and immunoflourescence using multiple cell model systems which express either no ERs, ERα alone, ERβ alone or a combination of ERα and ERβ, to ensure its specificity for the β isoform. These data have revealed that this antibody is highly sensitive for the detection of ERβ and exhibits no cross-reaction with ERα or other proteins (data not shown). ERα (H-20) antibody was purchased from Santa Cruz Biotechnology (Santa Cruz, CA, USA). Flag (M2) and α-Tubulin (DM 1A) antibodies were purchased from Sigma Aldrich. All cell lysates were harvested using NETN buffer (150 mM NaCl, 1 mM EDTA, 20 mM Tris (pH 8.0), 0.5% Nonidet P-40) and insoluble material was pelleted. Protein concentrations were determined using Bradford Reagent and equal amounts of cell lysate were separated by SDS-PAGE. Proteins were transferred to PVDF membranes, probed with primary and secondary antibodies and visualized using enhanced chemiluminescence (Amersham Biosciences, Piscataway, NJ, USA). MCF7-ERβ cells were plated in 12-well tissue culture plates at approximately 70% confluence and subsequently transfected in triplicate with 250 ng per well of the ERE-TK-luciferase reporter construct using Fugene 6 (Roche Applied Science, Indianapolis, IN, USA). Following transfection, cells were treated as indicated for 24 h. Cells were lysed in 1× Passive Lysis Buffer (Promega, Madison, WI, USA) and equal amounts of extract were assayed for luciferase activity. MCF7-ERβ or U2OS-ERα/β cells were plated at a density of approximately 50% in 100 mm tissue culture plates. U2OS cells were treated with doxycycline as previously described to induce expression of ERα and ERβ  and subsequently exposed to indicated concentrations of endoxifen. Following 24 hours of incubation, cells were washed twice with PBS and lysed in NETN buffer. Equal amounts of cell lysates were immunoprecipitated at 4°C overnight using 1 μg of either Flag or ERβ antibody. Protein complexes were purified using protein G beads, separated by SDS-PAGE, transferred to PVDF membranes and blocked in 5% milk overnight. Western blotting was performed using indicated antibodies as described above. MCF7 and MCF7-ERβ cells were plated in 12-well tissue-culture plates and treated in triplicate as indicated for 24 hours. Total RNA was isolated using Trizol reagent (Invitrogen) and 500 ng was reverse transcribed using the iScript™ cDNA Synthesis Kit (Bio-Rad). Real-time PCR was performed in triplicate using a Bio-Rad iCycler (Hercules, CA, USA) and a PerfeCTa™ SYBR Green Fast Mix™ for iQ real-time PCR kit (Quanta Biosciences, Gaithersburg, MD, USA) as specified by the manufacturer. Quantitation of the PCR results were calculated based on the threshold cycle (Ct) and were normalized using TATA Binding Protein as a control. All PCR primers were designed using Primer3 software  and were purchased from Integrated DNA Technologies (Coralville, IA, USA). Primer sequences are provided in Additional file 1. MCF7 and MCF7-ERβ cells were grown in 10% triple charcoal-stripped serum-containing medium for three days and subsequently plated at a density of 2,000 cells per well in 96-well tissue culture plates. Cells were treated with vehicle, 1 nM estrogen or 1 nM estrogen plus increasing concentrations of endoxifen (20 to 1,000 nM) for eight days. Culture medium and treatments were replaced every other day. Proliferation rates were determined using a CellTiter-Glo Luminescent Cell Viability kit (Promega). Changes in the gene expression profiles of MCF7 and MCF7-ERβ cells elicited by either 1 nM estrogen alone or estrogen plus 40 nM endoxifen were determined using the Illumina HumanHT-12 expression BeadChip platform to screen more than 27,000 annotated genes represented by 48,804 probes by Mayo Clinic's Advanced Genomics Technology Center (Rochester, MN, USA). Data were processed using BeadStudio Version 3.1 and normalized using the fastlo function  implemented in the statistical package R. Data were filtered to exclude probes (referred to as genes throughout) whose expression was at or below background levels as determined by detection P-values (≥0.05). Pair-wise comparisons were made to identify differentially expressed genes using Linear Models for Microarray Data (LIMMA). Genes were determined to be significantly regulated if their differential P-value was < 0.05 between groups. Fold changes were calculated by raising 2 to the power of mean difference (log 2 scale) between the treatment groups and controls. The normalized and raw microarray data presented here are available in the Gene Expression Omnibus  under the accession number: [GEO:GSE27375]. Genes determined to be significantly regulated by the addition of 40 nM endoxifen relative to estrogen alone in both parental and ERβ expressing MCF7 cells were further analyzed using MetaCore software to identify differences in biological pathways altered between the two cell lines. Genes with differential expression P-values < 0.05 from each comparison were used as focus genes and a hypergeometric test was applied to each of over 600 canonical pathways. Enriched pathways with P-values < 0.05 were suggested to be significantly regulated by the addition of 40 nM endoxifen within each cell line. Adjustment for multiple comparisons was conducted using a false discovery rate of 0.25. 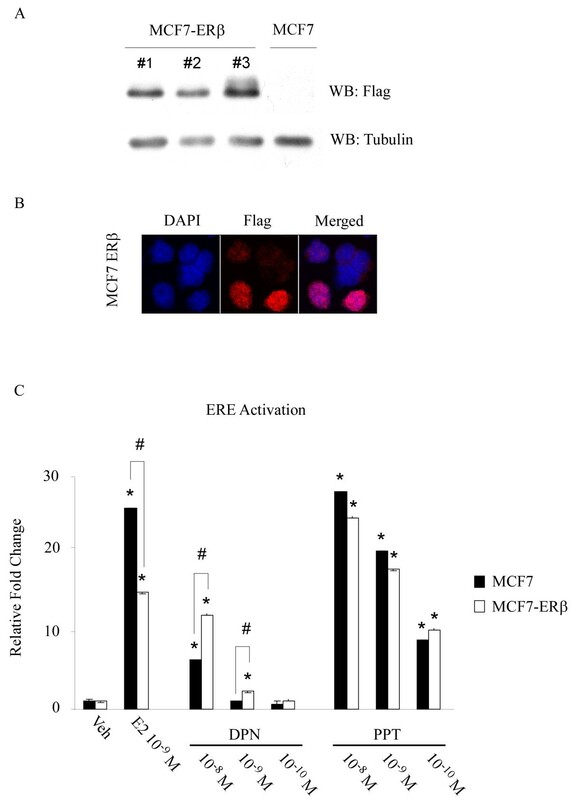 In order to determine the effects of ERβ expression on the actions of endoxifen in breast cancer, we first developed MCF7 cell lines stably expressing this receptor. MCF7 cells were chosen for this study since they are the most well characterized ERα positive breast cancer cell line with regard to estrogen regulated gene expression and proliferation. As shown in Additional file 2, the parental MCF7 cell line used throughout this study was confirmed to be ERβ negative by both real-time PCR and Western blotting and these data are shown relative to the expression of ERβ mRNA and protein in one of our over-expressing cell lines. Multiple MCF7-ERβ clonal cell lines were developed by expressing S and Flag-tagged full-length ERβ followed by selection with G418. All cell lines were screened for ERβ protein expression by Western blotting and three representative lines are shown in Figure 1A relative to parental cells. While all of the data presented in Figures 1, 2, 3, 4 were confirmed in multiple MCF7-ERβ clones, the data collected from clone number 3 were chosen for representation in these figures due to its robust expression of ERβ. Immunofluorescent staining using a flag antibody was utilized to verify ERβ positivity and cellular localization. The results demonstrate that ERβ is expressed and localized in the nucleus of MCF7-ERβ cells (Figure 1B). ERβ functionality was investigated using an estrogen response element (ERE) transcriptional assay involving an ERE-TK-luciferase reporter construct. The construct was transfected into parental and ERβ expressing MCF7 cells followed by treatment with either estrogen, the ERα specific agonist PPT or the ERβ specific agonist DPN. As shown in Figure 1C, estrogen significantly induced ERE activity in both MCF7 parental and ERβ expressing cells. Interestingly, estrogen induction of the ERE was significantly lower in ERβ expressing cells possibly due to the reported inhibitory actions of ERβ on ERα transcriptional activity. The ERβ specific agonist, DPN, resulted in significant activation of the ERE reporter construct in cells expressing ERβ (Figure 1C). ERE activation in parental MCF7 cells by 10-8 M DPN is explained by its non-specific interactions with ERα at high concentrations . As expected, all concentrations of the ERα specific ligand, PPT, resulted in identical ERE activation regardless of ERβ expression (Figure 1C). These data demonstrate that our newly developed MCF7-ERβ cell lines express intact and functional ERβ protein. Characterization of MCF7-ERβ cell lines. (A) Western blot (WB) analysis demonstrating expression of ERβ in three independent clonal MCF7 cell lines. (B) Immunoflourescence depicting nuclear localization of ERβ protein in stably expressing MCF7 cell lines. (C) Luciferase assays demonstrating transcriptional activation of a transiently transfected ERE by either ERα or ERβ in parental and MCF7-ERβ cell lines using estrogen, the ERα specific agonist PPT or the ERβ specific agonist DPN. * denotes significance at the P < 0.05 level (ANOVA) compared with vehicle controls while # denotes significance for a given treatment between the two cell lines. Stabilization of ERβ protein levels by endoxifen. 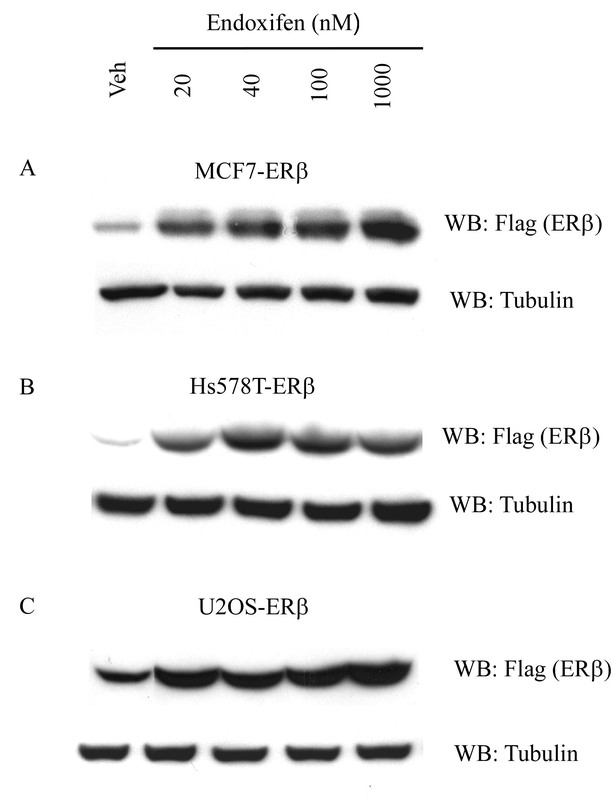 Western blot (WB) analysis of ERβ protein levels in MCF7-ERβ (A), Hs578T-ERβ (B) and U2OS-ERβ (C) cells treated with indicated concentrations of endoxifen or vehicle for 24 hours. Tubulin levels are shown as protein loading controls. Endoxifen induces ERα/β heterodimer formation. MCF7-ERβ (A) or U2OS-ERα/β (B) cells were treated with indicated concentrations of endoxifen or vehicle for 24 hours. Equal amounts of cell lysates were immunoprecipitated with an ERβ specific antibody. Immunoprecipitated protein (IP) complexes were separated by SDS-PAGE and Western blotting (WB) was performed using an ERα specific antibody. 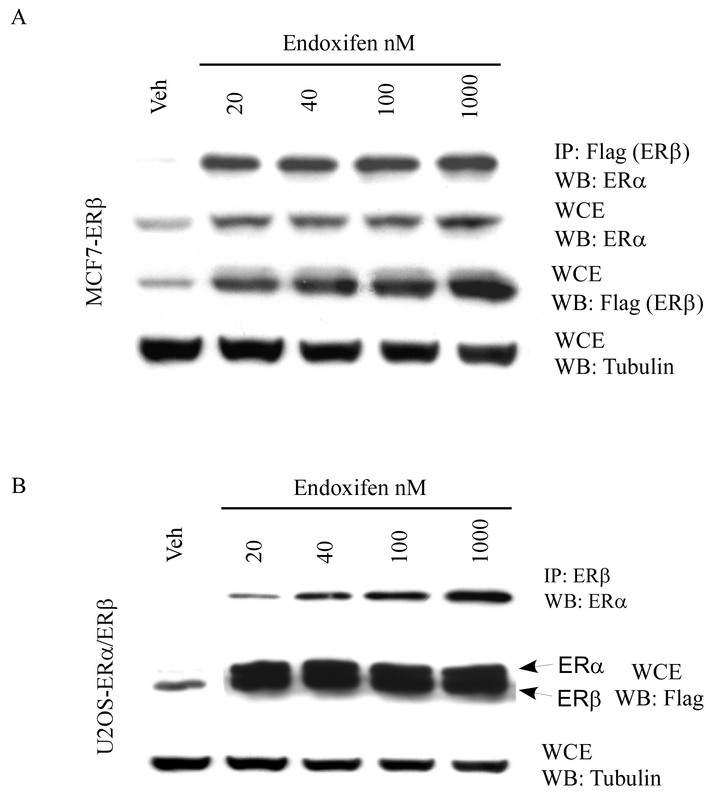 Non-immunoprecipitated ERα and ERβ protein levels were also determined by Western blotting in whole cell extracts (WCE) following endoxifen treatment. Tubulin levels are shown as protein loading controls. Repression of known ER target genes by endoxifen is enhanced in ERβ expressing cells. Parental MCF7 and MCF7-ERβ cells were treated as indicated for 24 hours. Real-time RT-PCR analysis was performed to detect expression levels of (A) cyclin D1 (CCND1), (B) PS2, (C) progesterone receptor (PR) and (D) amphiregulin (AREG). * denotes significance at the P < 0.05 level (ANOVA) compared to vehicle, # compared to estrogen treatment and δ for a given treatment between the two cell lines. Since we have previously demonstrated that endoxifen exposure results in rapid turnover of ERα protein in multiple cell types through proteasomal degradation , it was of interest to determine the effects of endoxifen on ERβ protein levels. 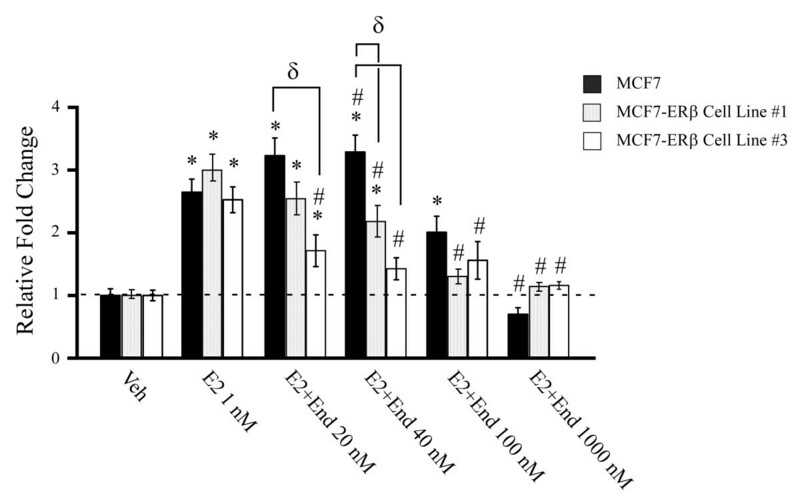 Unlike that of ERα, endoxifen exposure resulted in stabilization of ERβ protein in MCF7-ERβ cells in a concentration dependent manner (Figure 2A). These results were confirmed in Hs578T breast cancer cells and U2OS osteosarcoma cells stably expressing ERβ (Figure 2B, C). Given that ERβ protein levels are stabilized by endoxifen and that ERβ interacts with ERα, we next sought to determine if endoxifen exposure resulted in ERα/β heterodimer formation. Immunoprecipitation assays demonstrate that endoxifen induces ERα/β heterodimer formation in MCF7-ERβ cells which results in the stabilization and accumulation of ERα protein levels (Figure 3A). These studies were conducted in U2OS cells stably expressing both ER isoforms and similar results were observed (Figure 3B). The results of these studies demonstrate that exposure of cells which express both ER isoforms to endoxifen results in stabilization and accumulation of both ERα and ERβ protein likely due to its induction of heterodimer formation. It is speculated that ERα and ERβ homodimer formation likely occurs to some degree as well. Our laboratory previously characterized the inhibition of estrogen induced gene expression and proliferation by endoxifen in MCF7 cells . In order to determine the effects of ERβ expression on the anti-estrogenic actions of endoxifen, we next compared the ability of endoxifen to inhibit estrogen induction of known ERα target genes in parental and ERβ expressing MCF7 cells. The expression levels of cyclinD1, PS2, progesterone receptor and amphiregulin were monitored in both cell lines by real-time PCR following treatment with estrogen alone or estrogen plus increasing concentrations of endoxifen. In contrast to the ERE data presented in Figure 1, estrogen treatment further stimulated the expression of three of the four genes (PS2, PGR and AREG) in ERβ expressing cells relative to the parental cell line (Figure 4A-D). Interestingly, low concentrations of endoxifen (20 nM) significantly inhibited the estrogen induction of three of the four genes (CCND1, PS2 and PGR) only in ERβ expressing cells while higher endoxifen concentrations (100 to 1,000 nM) resulted in similar patterns of gene expression between the two cell lines (Figure 4A-D). These data suggest that expression of ERβ, in ERα positive breast cancer cells, enhances the anti-estrogenic properties of endoxifen. To confirm these data, and to determine if expression of ERβ enhances the ability of endoxifen to suppress estrogen induced cell growth, proliferation assays were performed. Two independent ERβ expressing cell lines are shown for these studies to ensure that the results are due to expression of ERβ and not clonal variation. Induction of cell proliferation following estrogen treatment was identical between parental and ERβ expressing MCF7 cells (Figure 5). Similar to the gene expression data presented in Figure 4, low concentrations of endoxifen (20 to 40 nM) significantly inhibited estrogen induced growth of MCF7-ERβ cells but not parental MCF7 cells (Figure 5). In fact, 100 to 1,000 nM concentrations of endoxifen were required to completely block estrogen induced growth of parental MCF7 cells while 20 to 40 nM endoxifen concentrations were essentially as effective in ERβ positive cells (Figure 5). These studies confirm that ERβ expression sensitizes breast cancer cells to the anti-estrogenic actions of endoxifen. Low concentrations of endoxifen inhibit estrogen induced proliferation of MCF7-ERβ cells. Parental and MCF7-ERβ cells (cell lines #1 and #3) were treated as indicated for eight days and cell proliferation rates were analyzed. Graphs depict fold change from vehicle treated cells. * denotes significance at the P < 0.05 level (ANOVA) compared to vehicle controls, # compared to estrogen treated cells and δ for a given treatment between the two cell lines. In an effort to determine the mechanisms by which low concentrations of endoxifen effectively block estrogen induced growth of ERβ expressing cells, but not parental MCF7 cells, the global gene expression profiles were examined in these two cell lines following treatment with estrogen alone or estrogen plus 40 nM endoxifen. The 40 nM endoxifen concentration was chosen since it resulted in the largest differences in proliferation rates between parental and MCF7-ERβ cells. Microarray analysis revealed that estrogen treatment significantly altered the expression of 461 genes in parental MCF7 cells using a fold change cutoff of 1.5 (Figure 6A). Of these genes, 211 exhibited increased expression while 251 exhibited decreased expression. Nearly 2.5 times as many genes were determined to be significantly regulated in the MCF7-ERβ cell line using the same statistical and fold change cutoff parameters. Specifically, 1,137 genes were differentially expressed following estrogen treatment of which 604 were increased and 535 were decreased (Figure 6A). Comparison of these two data sets revealed that 381 (31%) were commonly regulated between the two cell lines, while only 80 (7%) were unique to the parental cell line and 756 (62%) were unique to the ERβ line (Figure 6A). A list of these genes and their detected fold changes is provided in Additional file 3. Two genes exhibiting increased expression and two genes exhibiting decreased expression in response to estrogen treatment were randomly selected for each cell line and confirmed by real-time PCR. The relative expression levels for these genes as determined by both microarray and real-time PCR are shown in Figure 6B. Microarray analysis of estrogen and estrogen plus endoxifen treatment in parental and MCF7-ERβ cells. (A and C) Venn diagrams indicating the number of genes whose expression levels were significantly altered by at least 1.5-fold in response to 24-hour treatments of 1 nM estrogen in MCF7 or MCF7-ERβ cells (A) or 1 nM estrogen + 40 nM endoxifen relative to estrogen treatment alone (C). (B and D) Real-time PCR confirmation of selected genes whose expression levels were either increased or decreased by the addition of estrogen in MCF7 or MCF7-ERβ cells (B) or 1 nM estrogen + 40 nM endoxifen relative to estrogen treatment alone (D). The fold changes of each gene as detected by microarray analysis are shown for comparison purposes and all data have been normalized to vehicle controls (dotted line). We next compared the microarray results of parental and MCF7-ERβ expressing cells treated with estrogen plus 40 nM endoxifen to estrogen treatment alone. Using the same selection criteria as above, significantly fewer genes were determined to be regulated by this dose of endoxifen. In the parental cell line, the expression levels of 75 genes were altered by at least 1.5-fold by the addition of endoxifen of which 44 were increased and 31 were decreased (Figure 6C). 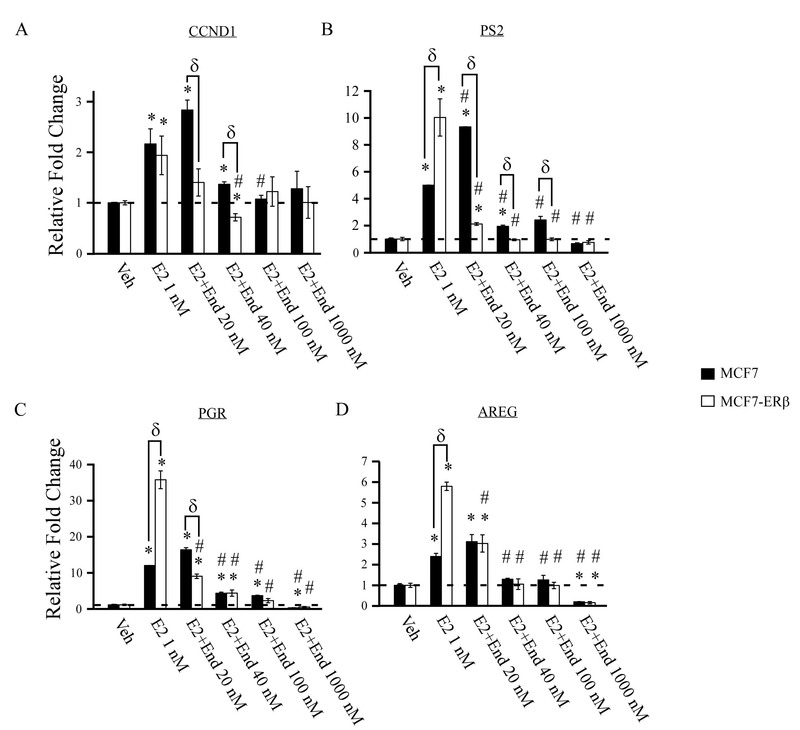 Similar results were observed in the MCF7-ERβ cell line in that a total of 78 genes were differentially regulated in response to endoxifen with 37 exhibiting increased expression and 41 exhibiting decreased expression (Figure 6C). Comparison of these two data sets indicated that 46 genes (43%) were commonly regulated in both cell lines while 29 (27%) were unique to the parental cells and 32 (30%) were unique to the ERβ expressing cells (Figure 6C). A list of these genes and their detected fold changes is provided in Additional file 4. As above, two genes exhibiting increased expression and two genes exhibiting decreased expression in response to endoxifen treatment were randomly selected for each cell line and confirmed by real-time PCR. The relative expression levels of these genes as determined by both microarray and real-time PCR following estrogen treatment alone and estrogen plus endoxifen are shown in Figure 6D. As with the proliferation data, to ensure that the detected gene expression differences in response to estrogen and endoxifen were truly due to the presence of ERβ and not a result of clonal variation, the confirmation of gene expression studies were also carried out in a second ERβ cell line (#1). These results revealed the same trends in gene expression elicited in response to both estrogen and endoxifen (Figure 7A, B) and suggest that these differences are in fact a result of ERβ expression and not due to clonal variation between cell lines. Confirmation of microarray data in a second ERβ expressing MCF7 cell line. (A and B) Real-time PCR confirmations were also carried out in a second ERβ cell line (#1) to ensure that the detected gene expression changes were due to the presence of ERβ and were not a result of potential clonal variation between cell lines. Relative fold changes of genes determined to be regulated by 1 nM estrogen alone (A) or by 1 nM estrogen + 40 nM endoxifen relative to estrogen treatment alone (B) are shown following normalization to vehicle controls (dotted line). The same trends in gene expression were detected in response to both estrogen and endoxifen in this second ERβ expressing cell line. Pathway analysis was performed on the gene lists generated from both the parental and MCF7-ERβ cells treated with estrogen plus 40 nM endoxifen relative to estrogen alone. For this analysis, all genes whose expression levels were significantly altered (P < 0.05) by the addition of endoxifen and whose fold changes were >2 standard deviations away from all genes kept in the analysis (approximately 1.2-fold) were utilized. This analysis identified 13 pathways in the parental cell line and 12 pathways in the MCF7-ERβ cell line which had significant enrichment of genes based on a P < 0.05. While none of these pathways passed a false discovery rate threshold of 0.25 after adjusting for multiple comparisons likely due to relatively small numbers of genes, it is interesting to note that biological pathways involving ERα cell cycle regulation and cell migration were only affected by endoxifen in breast cancer cells expressing ERβ (Table 1). As with the gene expression data, many of the identified pathways were unique to either the parental or ERβ expressing cell lines (identified by an asterisk) lending further support to the differential effects of endoxifen as a result of ER isoform specific expression (Table 1). The large majority of breast cancer patients display tumors that are estrogen dependent based on the expression of ERα. Deprivation of estrogen signaling, most commonly through the use of tamoxifen in the adjuvant setting, typically results in tumor regression. However, the use of ERα alone as an indicator of responsiveness to anti-estrogens is far from perfect as about one-half of ERα positive tumors do not respond to tamoxifen therapy and about 10% of ERα negative tumors do respond. These studies demonstrate that other estrogen and anti-estrogen receptors and/or signaling pathways may be involved in mediating the responsiveness of endocrine sensitive tumors to hormonal agents. Following the discovery of ERβ, investigators have sought to uncover the role that this protein may play in mediating breast cancer progression and treatment. Here, we demonstrate that expression of ERβ in ERα positive MCF7 cells significantly enhances the anti-estrogenic effects of endoxifen. This study provides evidence that endoxifen stabilizes ERβ protein levels and induces ERα/β heterodimer formation which results in differential gene expression patterns. Perhaps most importantly, our studies reveal that even low concentrations of endoxifen, mimicking that of poor and intermediate CYP2D6 metabolizers, results in repression of estrogen induced breast cancer proliferation in cells expressing ERβ, but not in those that express only ERα. ERβ is known to be expressed in normal breast epithelial cells and several studies have demonstrated that ERβ expression levels are suppressed in many breast cancers [51–54]. However, re-expression of ERβ in ER negative breast cancer cells has been shown to reduce both basal and estrogen induced proliferation rates [21, 24, 25]. Expression of ERβ in ERα positive breast cancer cells also results in suppression of proliferation following estrogen exposure [26–28]. Furthermore, ERβ expression has been shown to increase the effectiveness of high concentrations of SERMs such as 4HT, raloxifen and fulvestrant [28, 55]in vitro. While the latter studies did not analyze endoxifen, nor did they utilize clinically relevant concentrations of 4HT (plasma concentrations are less than 10 nM in patients receiving 20 mg/day), they do further implicate a role for ERβ in mediating anti-estrogenic activities. It is possible that the increased effectiveness of endoxifen in ERβ expressing MCF7 cells is related to the molecular actions of ERα/β heterodimers since we demonstrate that heterodimer formation is induced in a concentration dependent manner following endoxifen exposure. Indeed, the global gene expression changes induced by estrogen and anti-estrogens are known to be different in cells expressing both estrogen receptors relative to cells expressing only ERα or ERβ [20, 21, 56]. 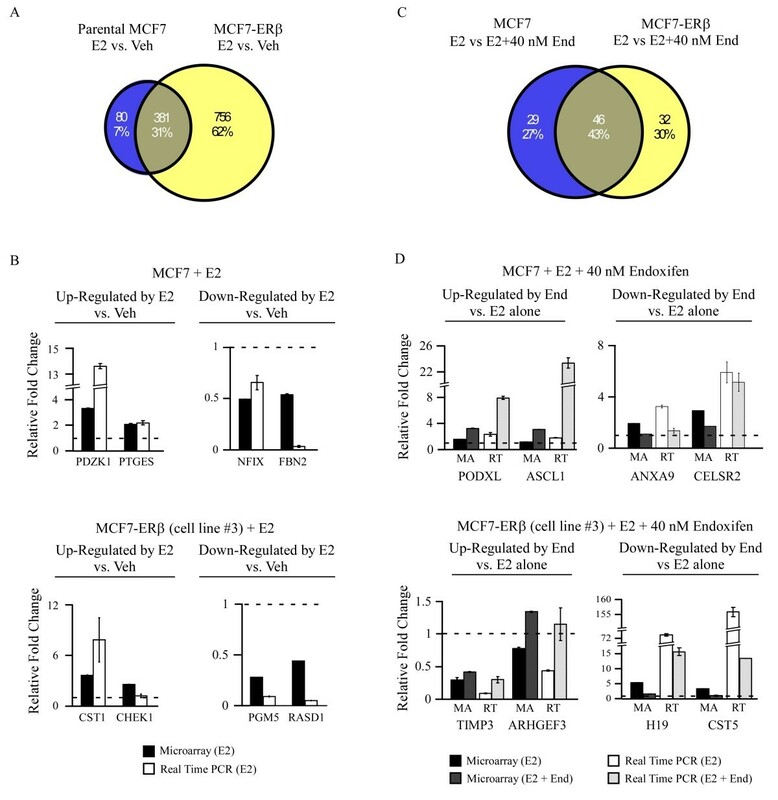 The results of the present study also demonstrate that both estrogen and endoxifen regulate unique subsets of genes in MCF7 cells expressing both receptors relative to cells expressing ERα alone. Biological pathway analysis of endoxifen regulated genes revealed that the majority of altered pathways are unique to either the parental or ERβ expressing cell lines. Pathways involving ERα mediated cell cycle regulation and cell migration were only affected in the presence of ERβ suggesting that the increased effectiveness of endoxifen may be through the inhibition of ERα activity by ERβ. The ability of specific compounds to induce ER heterodimer formation is of significant importance since these two receptors are often expressed in the same cells of many different tissues, including breast tumors, and since different dimer pairs have distinct genomic targets . Of particular interest is the observation that genistein, a compound originally thought to contribute to decreased breast cancer risk, specifically induces ERα homodimerization and transcriptional activity . This observation correlates well with more recent studies demonstrating that genistein is not effective in the prevention of breast cancer [59, 60]. Conversely, liquiritigenin is a highly selective ERβ agonist which does not stimulate ERα positive tumor formation  or ERα homodimerization  suggesting that it may serve as a suppressor of proliferation in ERβ expressing cells. The summation of these studies indicates that the identification of compounds which can specifically induce and/or activate ERα/β heterodimers or ERβ homodimers may have therapeutic potential. Endoxifen may serve as such a compound since it stabilizes ERβ protein levels and induces heterodimer formation in cells expressing both ER isoforms while simultaneously degrading ERα protein in ERβ negative cells . The identification of increased endoxifen effectiveness as an anti-estrogenic agent in the setting of ERβ is of significant clinical importance due to the fact that ERβ expression is reported to exist in approximately 75% of invasive breast cancers [33, 36, 37, 42, 62–64] and in a subset of tumors which are ERα negative [41, 45, 65]. The majority of reports suggest that the presence of ERβ in breast tumors correlates with improved rates of recurrence, disease-free survival and overall survival [29–38]; however, others indicate little correlation [39–41]. A few recent clinical studies have revealed that ERβ increases the effectiveness of tamoxifen therapy for breast cancer [44–46]. Given that endoxifen is being developed for the treatment of ER positive breast cancer, future studies should evaluate the association between ERβ expression and the activity of endoxifen in human breast tumors. The present data indicate that ERβ enhances the anti-estrogenic actions of endoxifen in breast cancer cells. These data correlate well with the clinical studies demonstrating increased benefit from tamoxifen therapy in those patients whose tumors are ERβ positive and suggest that this benefit may be through the actions of endoxifen. The ability of low endoxifen concentrations to significantly inhibit estrogen induced gene expression and proliferation in ERβ expressing breast cancer cells also suggests that benefits from tamoxifen therapy may still be observed in patients characterized as poor metabolizers based on CYP2D6 genotype if their tumors are ERβ positive. Finally, these studies highlight the need to further investigate the role of ERβ in breast cancer, both as a prognostic and predictive factor, and lend additional support to the development of endoxifen as a novel therapeutic for the treatment of endocrine sensitive breast tumors. The authors would like to thank Elizabeth Bruinsma, Kenneth Peters, Kevin Pitel and Muzaffer Cicek for their excellent technical support and Jacquelyn House for her outstanding secretarial assistance. Additionally, we would like to thank the Mayo Clinic Advanced Genomic Technology Center Microarray Shared Resource for their invaluable contribution to this study. This work was supported by Susan G. Komen for the Cure KG100142 (JRH), a Breast Cancer Research Foundation grant (JNI and TCS), a generous gift from Bruce and Martha Atwater (TCS, JRH, MPG, JNI), a Breast Cancer SPORE (P50CA116201) Career Development Award (JRH) and the Mayo Foundation. XW, MS, SBG, ZS, VN, WLL, TCS and JRH declare that they have no competing interests. MPG and JNI are named inventors (along with the Mayo Clinic) in regard to non-provisional patent applications regarding tamoxifen and CYP2D6; the technology is not licensed, and no royalties have accrued. XW, MS, WLL, MPG, JNI, TCS and JRH conceived of the study, participated in its design and drafted the manuscript. XW, SBG, VN and JRH performed the laboratory experiments and analyzed the data. ZS performed the microarray and biological pathway analysis. All authors read and approved the final manuscript.